The Crown Jewels of Scotland. The Scottish Crown Jewels are referred to as the Honours of Scotland. They are the oldest surviving regalia in Britain and consist of a crown, a sword and a sceptre. The crown dates from 1540 and was made from Scottish gold melted down from a previous crown. It was first used when James V wore it for the coronation of his second Queen, Marie of Guise. It is encrusted with 20 precious stones and 22 gemstones, along with Scottish freshwater pearls. The silver-gilt sceptre is the oldest item in the Scottish regalia, made in 1494, it was presented to James V by Pope Alexander VI, it was remodeled and lengthened in 1556. The sword of state was presented to James IV by Pope Julius II in 1507 and is of superb Italian craftsmanship. Its handle is silver gilt, richly decorated with oak leaves and acorns. The break in the blade of the sword occurred when it was snapped in two in 1652, while being hidden from Cromwell's troops. The scabbard is covered in red velvet, richly decorated with filigree work of silver. the belt is of silk and gold thread. The regalia were first used together at the coronation of the infant Mary Queen of Scots in 1543. The last occasion on which they were used was the coronation of Charles II as King of Scots, at Scone on 1st January, 1651. During Oliver Cromwell's occupation of Scotland, the jewels were hid at Dunnotar Castle, Cromwell had already notoriously melted down the English Crown Jewels. When Cromwell's troops pursued them there, the regalia were smuggled out in a bag and taken to the church at Kinneff. There they were entrusted into the care of a clergyman named Grainger, who buried them under the pulpit. 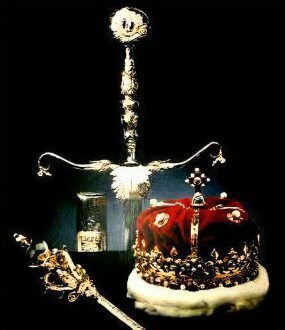 Under the terms of the Treaty of Union in 1707 the Crown Jewels were retained at Edinburgh Castle, where they were locked up in an oak chest. Forgotten for over 100 years, they were rediscovered in 1818, one of those present at the opening of the chest was the author Sir Walter Scott. They were put on display to the public at Edinburgh castle along with the Stewart and Lorne jewels. They were joined, on St. Andrew's day, 30th October, 1996, by the ancient Stone of Destiny, returned to Scotland after 700 years. Generations of Scotland's sovereigns, from the 9th century, had been crowned upon the stone. In 1296 it had been taken and carried to England by Edward I, who had a coronation chair made for it in Westminster Abbey. All subsequent Kings of England were then crowned seated over it. Agreement was finally reached to return the stone to its country of origin. Other jewels on display at Edinburgh Castle include the Stewart and Lorne Jewels. The Lorne Jewel is a necklace with a pendant and locket. The Stewart Jewels, the jewels associated with the Stewart dynasty, consist of a ruby ring, a collar of the Order of the Garter and the St. Andrew Jewel. The St. Andrew Jewel was made for James VII and II in 1687-88. It has a cameo of St. Andrew with a saltire and a thistle and is surrounded by twelve diamonds. They were taken to France in James' possession when he fled the throne before the armies of William of Orange in 1688. They continued to be passed down in the Stuart family, their last owner being James younger grandson, Henry, Cardinal York the last of the luckless Stuart dynasty. On his death in 1807, he bequeathed the jewels to George III, to ensure their return to Britain. On 8th December, 1830, William IV had the jewels housed at Edinburgh Castle.